As part of Remembering Srebrenica Scotland (RSS)’s White Arm Band Day commemorations on 30th May 2019, Glasgow Caledonian University is hosting an afternoon seminar (3pm to 5pm) featuring speakers who lived through the war in Bosnia in the early 1990s, or have experience of meeting survivors during RSS delegations to Sarajevo, Srebrenica or Tuzla. Resad Trbonja, a boy soldier during the siege of Sarajevo. 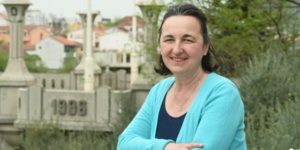 Dr Branka Antic Stauber, a psychologist and researcher in postwar trauma at Mostar University Hospital, who has started a social enterprise to support widows and victims of the Srebrenica atrocities. This session will be of interest to educators, researchers and women’s groups, as well as members of past Remembering Srebrenica Scotland delegations. Following the afternoon event, Remembering Srebrenica Scotland will host a White Armband Commemoration event at the same venue. For more information and to register, please go here.